The latest image submissions come from James Adamson from County Mayo, Ireland. I think you'll agree, they're quite impressive!
" I had all the equipment setup in my front garden at home a good half hour before first contact. I used a 12 eyepiece at 50x, glass solar filter was fitted to my 85mm refractor. Skies remained very clear, conditions were just perfect. Just on 10.52am BST first contact of the moon was observed! 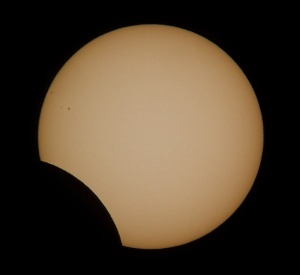 Within a few minutes the Moon's disk was moving quickly across the lower area of the Sun's disk. What a beautiful sight - at it's greatest it was spectacular! I took some images leading up to maximum eclipse and then again shortly after. The image above was taken at maximum eclipse. Some small sunspots can be seen on the Sun's left limp. About fifteen minutes after maximum some cloud started to move in, this finished my observations pretty quickly. Nevertheless I'm glad that I got to see this event. This was my first good view of a partial solar eclipse to date! " This image of Saturn was taken on the 2nd of March 2006 at 22.00 (gmt). Equipment used: Celestron 8inch SCT mounted on EQ5 german equatorial mount. Philips toucam pro 2 webcam with ir/uv filter fitted. 2 x barlow. 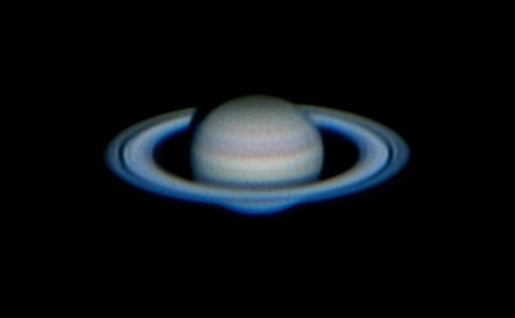 1000 avi frames were captured then aligned and stacked in registax v3. Colour correction was done in Paintshop Pro 9. Conditions at the time the frames were taken was good with short periods of excellent seeing. James reckons that this is one of his best images taken of Saturn so far! 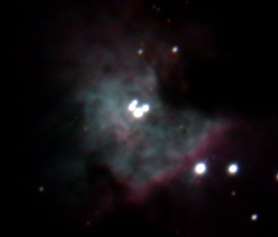 This m42 image was captured on 21nd of February 2006 at 22:30 (gmt). For this image of the bright central core of m42 and the trapezium stars, James took ten five second exposures with a Nikon Coolpix 4500 camera attached to a 32mm plossl eyepiece and Celestron 8inch SCT. Settings were: ISO 800, f/2.6; 5sec exposures. 10 frames were aligned, stacked and processed in registax v3, final adjustments were done in Paintshop Pro 9. 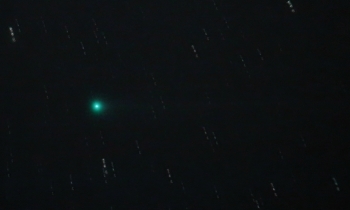 The above image of Comet Pojmanski taken on the morning of the 3rd of March 2006 between 05:07 - 05:32 (gmt). Equipment used: Televue 85mm APO refractor mounted on a german equatorial mount (EQ5) Nikon Coolpix 4500 digital camera was coupled to a 27mm panoptic with a lumicon deep sky filter attached. The camera was set at ISO 800, f/2.6 exposure was 60 seconds each. Ten of the best frames were then aligned and stacked in registax v3. alignment was done using the comet as a guide, the resulting final image shows the apparent motion of the comet over a 25 minute period moving North. In the image a very faint thin tail stretching over a degree in length can be seen.